It’s been three years since the main characters from Two Moons Bakery (TMB) met and fell in love or broke up. This story follows secondary characters first introduced in Two Moons Bakery, Sweet Sarah’s Bluez, and Forever Woman, chronicling how they converge or diverge at another central meeting place known as Ferrelli’s Restaurant. The restaurant is owned by Maria Ferrelli, a single widowed lesbian who is trying to keep her struggling family restaurant afloat. Dr. Leah Williams (SWEET SARAH’S BLUEZ) is 45-year-old English professor who has been unlucky in love and is dissatisfied in her career. She is in therapy, but is uncooperative and resistant, which may jeopardize her job at Metro U.
Maria Ferrelli (FOREVER WOMAN) is 47-year old owner of a small Italian restaurant downtown in NoHo. She has a staff full of misfits who are also related to her through blood or marriage. Her restaurant was the talk of the town when it opened years ago, but now seems to be losing money. Can the two women overcome their rocky first meeting to explore common interests and a mutual attraction at Ferrelli’s Restaurant? 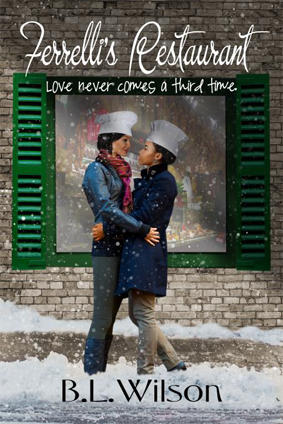 Ferrelli’s Restaurant, love never comes a third time is available for pre-order 10/25/17 on Kindle. The release date is 11/2/17.